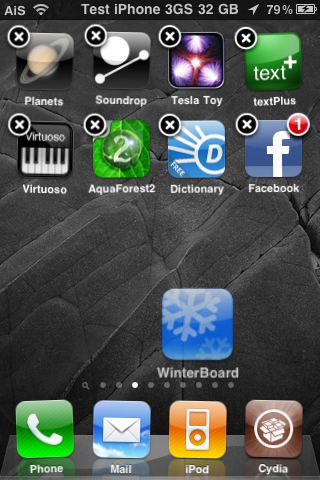 EasyRearrange is a hack that allows you to quickly rearrange apps on your SpringBoard. The hack starts like every other rearranging application… by putting your icons into “wiggle” mode so that you are able to move them around your SpringBoard. Now, this is where the application is different from the rest, you then tap the icon you would like to move. This will suspend the icon allowing you to scroll to the page you would like the icon moved to. So, instead of dragging the icon from one page to the next page to the next page until you are on the page you would like… the icon stays put and the pages move behind it. Then, just tap the Home button and the icon will drop onto that page.